Thank you for considering Camp One Way for your event! We will tailor a package to meet your group’s needs. Camp One Way is a single use facility, so you will not be sharing the facilities with another group during your stay. If you have any questions feel free to give us a call at (217) 676-2533 or send us an email info@camponeway.org. Below are some of the options we have available for your ministry. 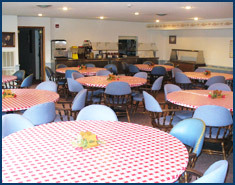 Day Time Use: Luncheons/banquets, staff training, seminars, reunions, father/son & mother/daughter events, family days, etc. Overnight Use: Youth group lock-ins & retreats, men’s/women’s retreats, family weekends, summer camp weeks, etc. 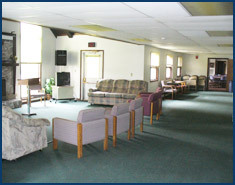 We can comfortably sleep 60 in our dormitory style year round retreat center. Four of our rooms are conveniently located on the main floor, with the other 16 rooms above. Most rooms sleep 3 to 4 people. There are six showers upstairs and two showers downstairs that are centrally located. We do offer a room upstairs, for leaders, that includes a queen sized bed, kitchenette and private bath. Each room is fully air conditioned/heated and has free wireless internet available. Camp One Way has earned a reputation for serving great food in a relaxed setting. We serve nutritious and well-rounded meals complete with drink stations, dietary options, and delicious desserts. We take care of every detail, which allows you to sit back and enjoy fellow-shipping with your friends. Our dining room comfortably seats 60 with a family style feel. Guest groups are encouraged to help us plan menus that suit their specific needs. We have a large meeting room which includes a computer, a large screen, and seating for 60. Whether you need a large area for general sessions, smaller spaces for break out sessions, or just a place to have a fire and some intimate conversation, we’ll work to suit your needs. If given enough notice we will have your space set up to your specifications prior to your arrival. 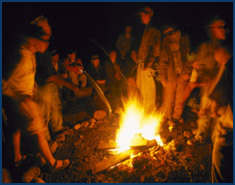 There is no shortage of things to do during your stay at Camp One Way. Or, perhaps rest and relaxation is what you are looking for. Whatever the need, our friendly staff will help make your retreat special. INSIDE - Our game room which includes: a chalk board wall, air hockey, carpet-ball, and a pool table. We also have several board games and puzzles available for rainy days. 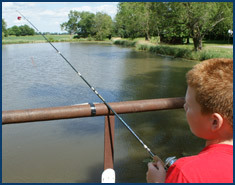 OUTSIDE – Basketball, Gaga Ball, tether-ball, volleyball, marshmallow shooters, pedal boats, canoes, a pond (great for fishing! ), 2 fire pits and 40 acres of nature to hike. Our goal an Camp One Way is to offer affordable retreats where ministry and fellowship can happen. We will do everything we can to accommodate any budget. Please contact us for current rate information.